It’s seems the Midwest can’t catch a break on the weather. Widespread drought has hit the region hard and now areas along the Mississippi and farther east have seen heavy rain and flooding, bringing back unwanted memories of the historic floods just two years ago. Chicago had its wettest April on record and Grand Rapids was transformed into an aquarium. Although many rivers remain above flood stage, hopeful stories are beginning to emerge that relief may have arrived as the record rains have departed the region. However, as the Midwest is out of the extreme rain woods for now, it remains in the thick of potential health impacts that linger well after rivers have crested and waters have retreated. The huge sigh of relief that the flooding is over is more than welcome, but the region needs to remain vigilant as the impacts story continues to unfold in sometimes unrecognized ways. Loss of life rightfully captures the headlines on flood impacts. So far four deaths have been attributed to this flooding. Floods have historically been one of the most deadly types of disasters in the U.S. Over the 30-year period from 1982 to 2011, an average of 93 live were lost due to flooding each year, which makes it deadlier than lightning, tornadoes, and hurricanes over that same period. Much of this loss of life is due to drowning. But beyond the immediate dangers to human life during the flood, more hidden and less obvious threats are present both during the flood itself and well after the waters have begun to recede. UCS colleagues and I looked into more detail at some of these that aren’t always on peoples’ radars or may be wholly unaware of — as I was prior to this work. It’s these hidden impacts that people in the Midwest will likely be confronted with over the coming days and weeks. Drowning while driving was probably the risk that caught me most by surprise. Of the flooding deaths in 2010, almost half of them were a result of attempting to drive through flooded areas. In the current Midwest flood, two men separately drowned while attempting to drive through the same swollen creek in Indiana. The risk is such that the National Oceanic and Atmospheric Administration actually has a dedicated campaign, “Turn Around, Don’t Drown”, for this issue. Water is particularly at risk during flooding due to contamination, with serious health implications. Drinking water and recreational waterways can be contaminated with sewage, agricultural waste, chemical pollutants, and animal waste. 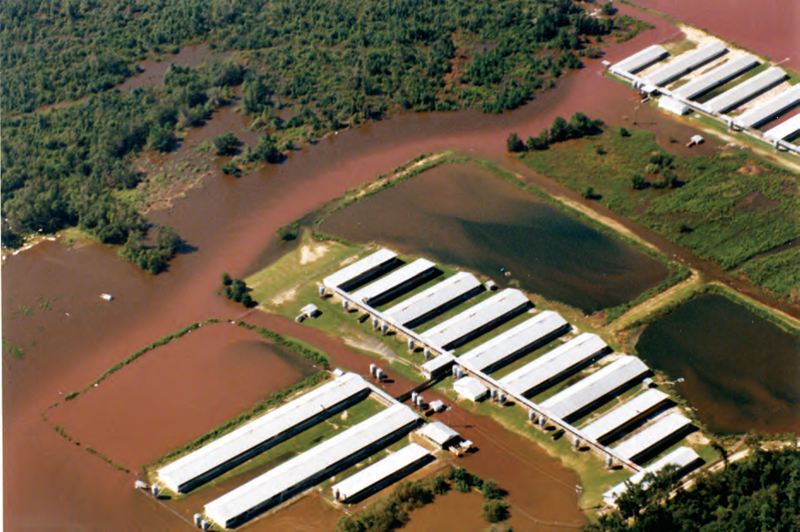 A vivid picture of these risks is hog farm waste spilling over its storage lagoon and into the surrounding areas after Hurricane Floyd in North Carolina — one of the more unpleasant of numerous unpleasant images we came across for our report. In another well documented case, after a very heavy rainfall event in Milwaukee in 1993, an outbreak of the parasite cryptosporidium occurred and affected more than 400,000 people. The risk of outbreaks and contamination may be heightened for areas in the Midwest now dealing with flooding as there is a high concentration of combined sewer overflow systems there that are more prone to backup and contamination during heavy rain. As I’ve found by encountering empty shelves when a tropical storm or hurricane is on the way, stocking up on water is the first line of defense. But beyond that the Centers for Disease Control (CDC) have useful information for dealing with flooding and its aftermath. Signing up for local boiled water alerts is probably also a good idea even for those not directly impacted by flooding as drinking water may be coming from distant sources that have been affected. This raises the more general question of “do you know where your drinking water comes from?” I don’t think I do. And saving perhaps the most hidden risk of all for last, mold can pose serious health threats and linger well beyond the actual flood. Water anywhere in the home can lead to a mold outbreak and this risk is obviously going be heightened during flooding. Mold can lurk behind drywall, under carpeting, in furniture, or in insulation, making it hard to detect. It can trigger allergic reactions and respiratory symptoms, including asthma attacks. This leads to a real drag on the health care system and the economy; some estimate annual expenses of between $2.1 and $4.8 billion. Some studies have shown that infants and children exposed to mold are more likely to develop asthma than those who haven’t. Unfortunately, not only can mold be difficult to detect, but it is also costly to remove once widespread. Drying out affected areas immediately, if possible, reduces risk of outbreaks and is the first step. Again the CDC provides very helpful information in dealing with this threat. Right now the conversation needs be focused on helping those in the Midwest deal with flooding impacts already being felt and those that could still be lurking. But asking questions about the next flood, and if cities and the region are going to be prepared, is critical as there will surely be more. There is ultimately an entire chain of risk factors that influence flooding and impacts that can be addressed at the national level all the way down to individuals. Climate change in the region represents a growing risk factor for flooding. The Midwest has seen a 45 percent increase in the heaviest precipitation events between 1958 and 2011, increasing the risk of dangerous floods. Over roughly the same period temperatures in the Midwest increased twice as fast as the entire period since 1900. If you look at the period since 1980, temperatures increased three times as fast. Correlation doesn’t always imply causation, but these trends fit with our picture of how heavy precipitation tracks with temperature. The basic physics behind this is that warmer air can hold more water vapor before it rains out, so the old adage “when it rains it pours” is unfortunately becoming more apt. Future projections show the same trend continuing as these heavy events become more likely under continued warming in the region. So limiting warming is one control knob to reduce flooding risk by dealing with the problem before it hits the ground. Other possibilities open up once the water does hit the ground. Cities can play a role in how storm water is managed. There seems to be a great deal of opportunity in improving sewers, especially in the Midwest and Northeast. Chicago, which was in the thick of the deluge, has taken action by installing rain blockers, investing in rooftop and rain gardens, and increasing permeable surfaces to help manage runoff and flooding. Cities can determine if development should take place in areas prone to flooding as way to address risk. City and state health departments can also ensure that their response plans and resources to be mobilized are in place. But there’s also a strong role for the individual in protecting themselves and their families from flooding impacts and reducing risk. Maybe the most critical step is being aware of the myriad health impacts beyond the obvious and developing effective responses to those. I’ll interject my own flooding story here, which while paling in comparison to what others are currently facing, illustrates the point about what individuals can do. My house was partially flooded during a tropical storm prior to working on our flooding report. I was completely unaware of all of the potential impacts involved and how to address those, beginning with not buying any potable water beforehand, to being told by my landlord that I should probably put fans on the flooded areas, to not turning off the power before going into my basement, to not checking to see if my faucet water was safe to drink. Luckily, we came out okay, but looking back the biggest risk factor for me was not being aware of what exactly I was facing. So while the work at UCS started with how a warming world increases the risk of flooding, it ended up being about the actual, household-level impacts and especially those that are hidden. That’s what Midwesterners are going to be facing in the coming days and weeks. Sadly, they’re not in the clear yet.